Landing Page FAQ: What is Landing Page "Friction"? Landing page friction is a term used to describe any element of your landing page that’s preventing users from converting. This can be anything such as page length, privacy disclaimers, imagery, layout, text and more. In order to get to the bottom of what exactly is causing friction on your page, you’ll need to get accustomed to regularly testing different elements of your page. For the complete answer to "What is landing page "friction" check out The Complete Landing Page Dictionary. Take a look at this example from Content Verve. Their hypothesis was that they weren't providing enough information within their form, and as a result, this was causing friction. As a result, they tested another variation that had more details on what exactly users were signing up for. And the result? 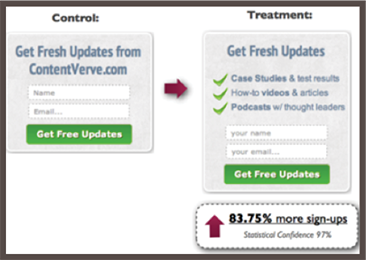 An 83.75% increase in conversions. Always be cognisant of what elements (or lack of elements) on your page could be causing users to not convert. By identifying these elements through A/B testing, you’ll be able to refine your landing page experience and reduce the overall friction of the page. There are a million other potential causes of friction and these are just a few. The important takeaway is to understand what friction is and how you can go about getting to the bottom of how to resolve it.